International stocks make up roughly half of the global stock market. Relative valuations between U.S. and international stocks have rarely been this extreme. Research shows international stocks are more effective at hedging inflation than domestic stocks. International stocks substantially outperformed, and U.S. investors missed out by sticking close to home. 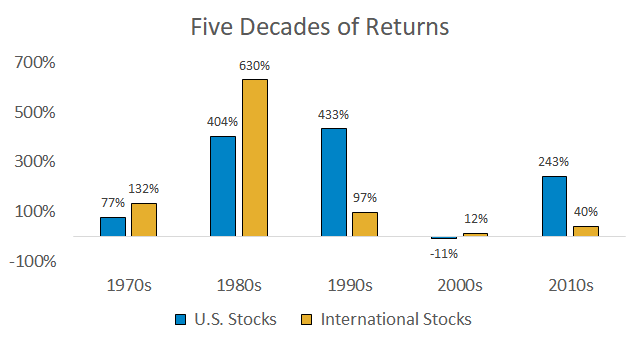 Since 2007, the roles have reversed, and U.S. stocks have generated higher returns. 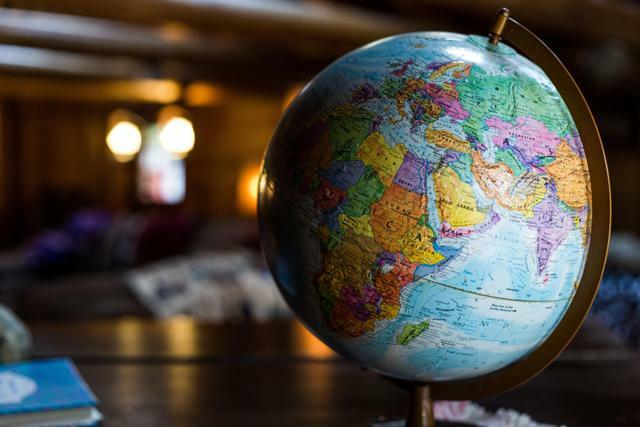 Many investors are now looking at their portfolios and asking "Why do I own international stocks if they've done so poorly over the past few years?" Current sentiment is opposite of what we saw in the mid-2000s: exuberant optimism over foreign investing and the rapid growth of BRIC nations. 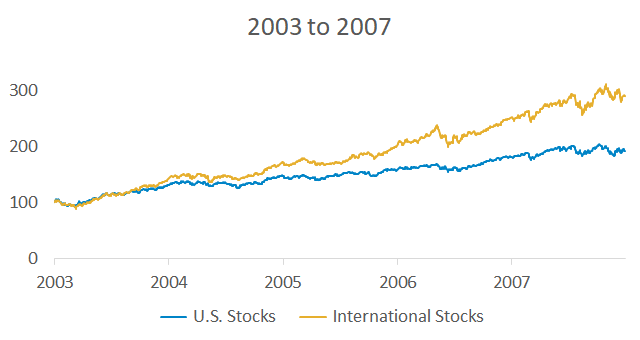 This makes sense - sentiment tends to chase performance, and international stocks did well in the mid-2000s. Investors without a plan typically buy what they wish they bought years ago. This performance chasing behavior leads to chronic underperformance. The goal of this post is to explain the "why" and "how much" of international stocks since investors should know why they own them and if their current domestic/international split makes sense. 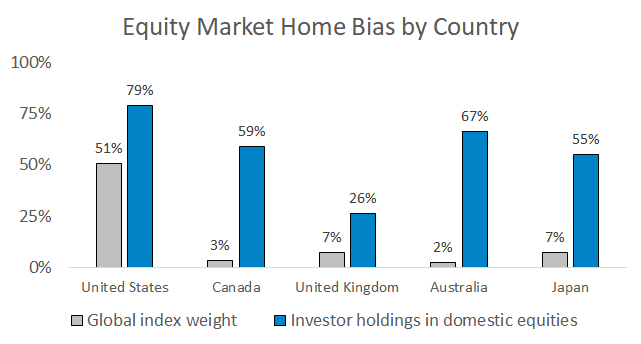 The main reason to own international stocks is to minimize the chance of unfavorable portfolio outcomes. Index fund investors say, "I don't know which individual stock or bond will perform the best so I just want to own them all." Data is proving this logic to be sound - index funds recently outperformed the average stock picking mutual fund for the ninth year in a row. Last year, a study found that "four out of every seven common stocks that have appeared in the CRSP database since 1926 have lifetime buy-and-hold returns less than one-month Treasuries." This is a pretty crazy statistic - greater than 50% of risky common stocks underperformed risk-free Treasury bills. One of the major reasons why most active stock picking mutual funds underperform is because there's a low probability they'll own the few stocks that do really well. High fees also set a high hurdle for index outperformance. So when it comes to stock selection, rather than search for a needle in a haystack, index fund investors buy the whole haystack. An investor only using U.S. stock index funds is not completely diversified though - there's more than just the U.S. stock haystack. The graph below shows that U.S. stocks make up roughly half of the global stock market. An optimal allocation split between U.S. and international stocks only exists in hindsight. In reality, the best allocation is the one you'll actually stick with over the long run. The domestic/international split I use in the passive portion of client accounts is 50% in U.S. stocks through VTI and 50% in international stocks through VXUS, since this is a truly passive representation of the global stock market. Current valuations point to a higher probability of international stocks outperforming U.S. stocks over the next decade. The graph below shows that international stock valuations haven't been this low relative to the U.S. in 20 years. International stocks are also cheap on an absolute basis. A large number of major international stock markets like Japan (EWJ), Germany (EWG), and Australia (EWA) currently trade at CAPE ratios below 20. The chart below shows the strong historical relationship between starting valuations (x-axis) and future long-term returns (y-axis). Investors sometimes get caught up in minutiae when measuring valuations. They try to pick the best valuation ratio, the right time period, etc. 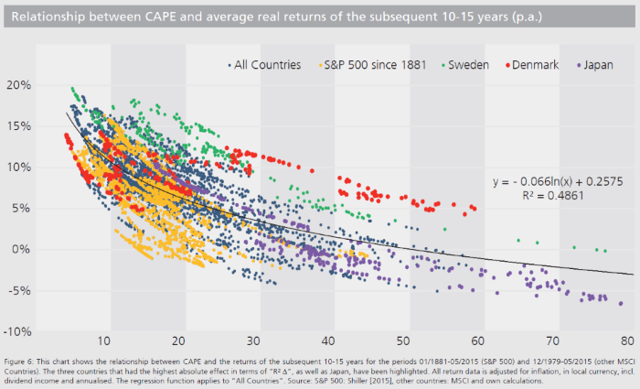 But the big picture relationship between valuations and returns is easy to understand. Expensive assets eventually price in perfection, reality doesn't measure up to overly optimistic expectations, and the expensive asset becomes cheaper. Cheap assets are cheap because investors have abandoned them and no longer expect anything positive to happen. These expectations end up being overly pessimistic and cheap assets rise in value as expectations are adjusted higher. Cheaper valuations are a welcome feature of international stock exposure in 2019, but obviously current valuations are fleeting so I don't consider valuations to be a long-term benefit of international exposure. I hope you found this post useful and do leave a comment if you have any questions. Disclosure: I am/we are long VTI, VXUS. I wrote this article myself, and it expresses my own opinions. I am not receiving compensation for it. I have no business relationship with any company whose stock is mentioned in this article. 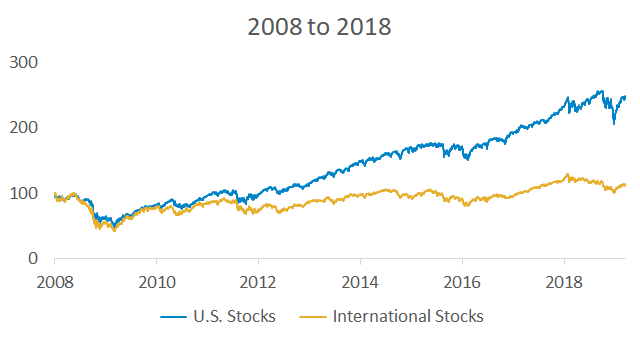 Additional disclosure: The “2003 to 2007” and “2008 to 2018” graphs use VTI for U.S. stocks and VGTSX for international stocks. Data shown includes dividend reinvestment and reflects fund expense ratios. The “Five Decades of Returns” graph uses annual return data on the S&P 500 (www.bogleheads.org/...) and MSCI EAFE (www.bogleheads.org/...) indices from the Bogleheads Wiki pages. The “Total Lifetime Returns for U.S. Stocks, 1983-2007” graph uses data from “The Capitalism Distribution” by Blackstar Funds. The “1970 to 1979” graph uses annual return data on the S&P 500 and MSCI EAFE indices and inflation data from the Bogleheads Wiki pages. Results shown are hypothetical, simulated, and are not an indicator of future results. Movement Capital (MVMT Capital LLC) is a registered investment advisor. Advisory services are only offered to clients or prospective clients where Movement Capital is properly licensed or exempt from licensure. This article is solely for informational purposes. Investments involve risk and are not guaranteed. No advice may be rendered by Movement Capital unless a client agreement is in place.